Editor’s Note: George is my father in law. He cruised for nearly three years on his Valiant 40’ with his wife Nancy. We asked him to help us crew the boat from Neah Bay to San Francisco. He also joined us on the San Francisco to Santa Barbara leg. The following -- reprinted with permission -- was his account of our northern passage. Sep 7 Sun.Neah Bay 6 am. There are no alternators working. (Remember there are two on a catamaran) No electrical help available Neah Bay. What the heck! We don’t need no stinking alternator. Motor out to Cape Flattery. Nearby are a few rocks and then Tattosh Island and lighthouse. Sail between and out. Rocks to south look like Easter Island heads. Must have been impressive for first native peoples, at that time. Future casino site, they are thinking. Sail at night on Bimini only 3.5 knots in 13 knot NW. It’s dark out here, cold, and we are doing things conservatively. I can’t remember if we are saving battery by hand steering or not. Ham potatos and veges. 93 nmi to Gray’s Harbor WA. Sep 8 Mon. 2pm Light conditions 12-20? In order to see what can be done about alternator problems we head for Grays Harbor. The entrance Bar is out beyond entrance. We barely noticed an increased size swell as we passed over it. Depth was 39 feet. This was at end of flood and at turn to ebb. Bar not a factor at all in these conditions. To Westport Marina. Into bay, turn right at second (wrong) entrance to harbor. Tie up Pier 6. Walk about trying to find a “marine’ electrican. We get one (sort of) he says “well we can take one off and take it to Aberdeen 20 miles away where they have real Marine equipment and facilities. Smaller harbor there, go figure. Starboard alternator put on port side by dean, Port alternator ok, no fuse. Or was it Starboard alternator no working? Switch alternators back again. I am totally confused. End “Reparis” result: 2 engines running 1 good alternator. One put back on starboard engine but not hooked up because no engine pulley to water pump belt. Need 3 pulleys to operate, at the moment anyway. Don’t try to figure this out unless you have been on boats a lot or just missed your old mechanics school classes. Question remains, is it ok to use nylocks on engine or alternator. To be answered later, or now by email to dean.conger@ gmail.com if you know the answer. Pork Curry w rice (of course) and red wine. Your on deck, I am going to hit the bunk and savor that curry. Continue on at about 5pm. Just in time to run thru the Cargo ships exiting Columbia River at night. Lesson in range lights on ships. Green or red helps if can see those tiny lights. One passes in front. Another. He turns south. Another behind. Another towards coast estim 5-10 miles out. We are about 15miles out. Sep 9 Tue. Winds up to 30 knots. Cape Blanco nearby. Hey, there is no propane. What? No hot cuisine? Jason (recovered) and I did not sign on for this! Mutiny looms it’s ugly head. Let’s go into Port Orford, OR. Anchor, moor, moor, yell and scream, anchor (no this is too close to the rocks), and finally anchor. Dean and Jason to shore w empty propane tanks and return with no local info/wisdom. Off in 30 knots (what the hell, the weather guy said it would be the same for 3 days, worse, we believed him) 30 knots to 32 knots, boy we are moving now. 35 knots. Hope that was just a gust. 15 minutes later 38 knots. Boy, some wind huh? 40 knots. Wait a minute, we are in a %*&^ gale! 42 knots. Goodby loved ones at home. 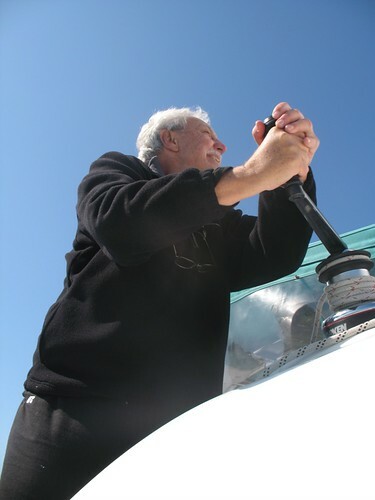 Rise up 12 footer and get weather helmed to starboard, sideways to wave….Ease the sheets. Can’t, they are already eased. Put in 2 reefs. Can’t they are already in! Take in the cockpit windows and protection. Can’t. Might cause lift under dodger/bimimi. Ok, a little jib out please. What the hell, you want more sail up? Discussion ensues. 3 hours of terror running broad at 150 degs to wind and waves. Not enough terror to not eat pesto! Please pass a bowl up to the helm. Boy it was great. Gale Pesto recipe: Olive oil, garlic, pine nuts, S and P, Ground Fresh basil over Tagliatelle. Presentation was not the focus. It looked great in a plastic bowl. Who’s to complain. Magical stuff pesto, or pasta. When you eat it the world changes. Happiness ensues, Tummy full. Pleasant thoughts. The wind just dropped to 35 knots. Heavens to Mergatroid! Who would thought 35 knots was like a Sunday sail? Faces brighten. Is there any more Pesto? Whoa, we entered N Calif waters hrs. ago. Crescent Bay behind us. Trinidad Head behind. Eureka behind. Sep 10 Wens. I dunno, a blurr. I wasn’t on watch. Sep 11 Pass Cape Mendocino? Lat 40 25’ 24N by 124 23’47W Punta Gorda Light. Point Cabrillo light. Point Arena light. Thu Motor south. Dean catches dead cormorant but keeps his dignity. Burial at sea. It’s hereditary. Nancy caught a live Booby. No! Not me! Sep 12 Fri Motor into Bodega Bay and Harbor for fuel and a little rest before Golden Gate and it’s activities and weather. Daylight trip tomorrow. Veg Soup. Delicious. Point Reyes 18 nmi. Motor. Pt Reyes Light FIW 24 mi q 5 secs. Left turn to Bolinas Bay and chute N side of 24 fathom bank. How deep is it? Uh, 6 times 24 is 144 feet minimum. No breakers, swells or terror there today. Point Bonita light and Cove port side. Cargo container ships starboard side. Saturday boaters bouncing like rubber ducks in a bathtub. Thru the gate. Pictures. Call everyone to internet the GG cameras. Dale calls via cell phone and replies, “Are you anywhere near a Cosco freighter?” Yes, it just passed south of us (about 5 times faster) and spoiled your view. Sailboat races all over the bay. Spinnakers galore. Hallow luya! We have arrived. Into port at Emeryville near the Bay Bridge and murdered Hell’s Angels leader. This must be near Oakland!